The Mets are having a great off-season under the wings of new GM Brodie van Wagenen. Something the new GM has addressed big time is Depth. With the additions of Lowrie, Broxton and JD Davis, they have improved our MLB depth with good and versatile players. The bullpen has improved drastically with the additions of Diaz, Wilson and Avilan and the return of Familia. But there is one spot on the roster which the Mets haven’t addressed as much so far this off-season, and in my opinion that’s the area van Wagenen should be looking to add depth: Starting pitching. The Mets rotation at the moment is Jacob deGrom, Noah Syndergaard, Zack Wheeler, Steven Matz and Jason Vargas. To me this is a very good rotation, as I believe Vargas will be close to his career norm, sporting an ERA around the 4.20. Which is solid as a fifth starter. That being said the Mets starters have injury history. We saw a health improvement from all the starter, besides ironically Jason Vargas, who was hurt parts of the first half. So what do the Mets have behind the rotation now? Yes the Mets still have Seth Lugo, a very reliable starting pitching option. We all remember Lugo dominating the Yankees at Citi Field last season, as it shows that Lugo is capable to provide a solid spot start if needed. But with that being said, Lugo has shown he is way more important as a bullpen piece. A guy who can give you innings out there with more dominance than when he starts. That’s a pretty big difference from a dominant reliever to a so-so starter. To me Lugo needs to be in the pen and provide depth and innings in that role. If you need a starter for one game, I wouldn’t mind Lugo to make the start, but if you need a starter for a longer period of time I would rather keep him in the role he excels in. The Mets lone minor league starting pitching signing this off-season so far is Hector Santiago. The former all-star has been in steep decline after his 2015 all-star season. Over the last 3 seasons Santiago didn’t have an ERA under 4.50. Last season Santiago was awful as a starter with a 6.12 ERA. He fared far better as a reliever owning a 3.87 ERA in that role. I believe the Mets will give him a look in Spring as he might provide innings out of the pen, more than been seen as a starting option. Just like with Lugo. We have seen Corey Oswalt pitch for the Mets in the Majors. He did make some solid starts, but even in those he was pretty lucky allowing some hard hit balls, that landed in gloves of the fielders. Oswalt sported a 5.85 ERA with a 1.37 WHIP for the Mets in 2018, not something you want pitching a lot. And at this moment you can argue that Oswalt is next in line to make multiple starts if needed, which to me is scary bad. Oswalt is just one season removed from being the Eastern League pitcher of the year for the Binghamton Mets (now Rumble Ponies). But still don’t see that much upside for the 25 year old, as his stuff is below average in my opinion. The Mets traded for Walker Lockett in the Kevin Plawecki trade with the Indians this off-season. Lockett has more upside than Oswalt in my opinion as he features a heavy sinking fastball with a solid curve and change. His sinking fastball is his main weapon as it features good movement. Lockett has pitched just 15 innings in the majors, but they weren’t pretty, as he allowed 16 earned runs in those innings. Still Lockett had a solid season in the difficult PCL with a 4.73 ERA (which is solid in the PCL) for EL Paso. If Lockett outperforms Oswalt in Syracuse, he can be next up if the Mets need a starter. 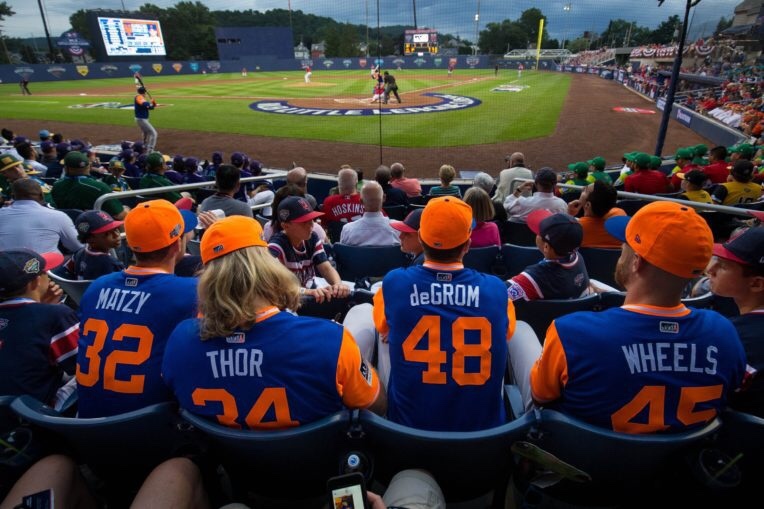 The Mets selected Dowdy in the Rule 5 draft this off-season, so he needs to be on the 25 man roster or MLB DL all season for the Mets to keep his services. That will give Dowdy an edge over guys like Bashlor, Smith and Hanhold to make the big league pen out of spring training. If Dowdy makes the squad, after a solid spring, he will likely be an eight man out of the pen who will pitch in long relief. That will include spot starting if needed. Dowdy had a down year in 2018 as a starter in the minors for the Indians and Tigers, but the Mets clearly see him as a relief option to take a look at this spring. Over 124 innings, Dowdy pitched to a 5.15 ERA combined in 2018. Here is something I found via Metsminors.net. Ceiling of low-leverage middle reliever if he takes to a ‘pen role and finds a more consistent off-speed pitch. If he can’t do those things, will be a 4A guy lacking another speed to pair with his high-velo fastball. OFP 40. Dowdy needs to take a bullpen role if he wants to have a shot at the MLB roster, so don’t see a problem here. If he doesn’t make the team he will need to be send back to Cleveland, and in my opinion there is definitely a possibility that happens. Chris Flexen showed off that he is in better shape working out with the Barwis program last week. Lets hope that something will get out of it with him being in better shape. Flexen had a lot of issues in the bigs in his stints in ‘17 and ‘18. His big league career ERA is 8.45 with a WHIP over 2. Again not something you want to see a lot if you are a Mets fan. But Flexen still has some promise, as he features a plus curve ball with a solid change. If he can add some mph on his FB there is still some promise for him being a solid depth piece, but we can’t count on that. The Mets still have Drew Gagnon on their 40 man roster, which probably won’t be the case this spring. But since he is still on the roster he is still starting pitching depth. Gagnon actually had the best season out of the mentioned depth (besides Lugo/Santiago) in the minors. He pitched to a 4.40 ERA in 163.2 innings between AA and AAA, with most of his work in the PCL. Gagnon led the PCL with strikeouts in 2018, striking out 167 in AAA. In the majors Gagnon pitched to a 5.25 ERA in 12 innings of work. His strikeouts per nine was just 6 showing that Gagnon is most likely being a AAAA starter type without much upside for the MLB level. At 29 years old I won’t expect any improvement. When you look at all of these options you can’t deny we can use additional starting pitching depth. With the injury history of most starters and ineffectiveness from Vargas in 2018, you still need more depth. As I do believe in Vargas to return to his career norm, you still need back-up if that isn’t the case. The Mets have talked with Gio Gonzalez as he could become the fifth starter with Vargas getting moved to the pen. That will provide Vargas as more of a depth starter behind the very strong starting five. Mets could also look at depth options like Ervin Santana, who is coming off an injury riddled-down year, if he takes a milb deal. Still with the Mets being constructed like it is right now, my main attention will be adding starting pitching. And with the Gio reports it seems like that what BVW is aiming for.